Well, there's not much time for yourself when you have two kids!! I managed to get 5 days of my December Daily completed!! I also managed to finish over 500 Christmas tags for my Alzheimer fundraiser!!! I was very happy with the outcome. Hooray! For this layout, I have a big pocket here where I folded the flap over and added some ribbon. Its perfect to hold the precious 'Dear Santa' letters from and to my little kiddies. I made it with the idea in mind to have an appearance of a letter. Materials Used: cherry cobbler, early espresso & very vanilla cardstock; On Board letters, Be of Good Cheer paper, Organza ribbon, Many Merry messages stamp set, Priority Postage stamp set, soft suede ink, postage punch, decorative label punch, Old Saint Nick rub ons (retired), and modern label punch. Oh, this layout I had decorating the Christmas tree in mind. The first thing that popped in my mind was to case the little Christmas tree from the SU 2012 holiday catalogue. And of course a spot for pictures at the bottom! Materials Used: cherry cobbler, early espresso & very vanilla cardstock; On Board letters, Be of Good Cheer paper, Holly Bouquet buttons(retired), retired Christmas stamp set, lacy brocade embossing folder, Mini Merry punch pack (2012 holiday catalogue), linen thread, 1/8" soliver mini brads, basic pearls, and glimmer silver paper. 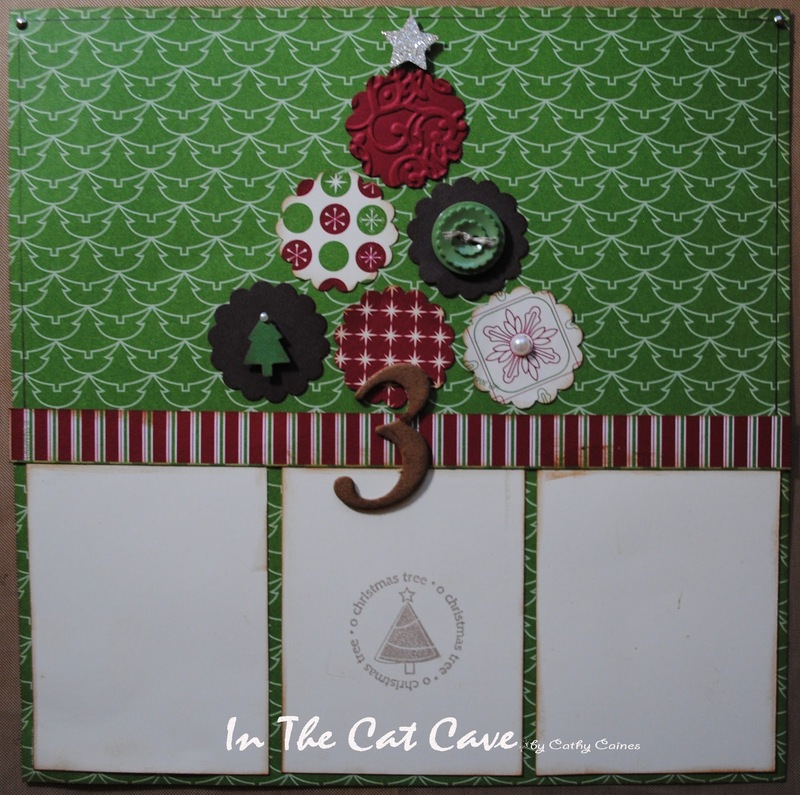 Oops, this one was supposed to be only a dingle layout but I made a mistake by gluing the page on the back of page 5. Hence, I made due and made it into a doube layout. 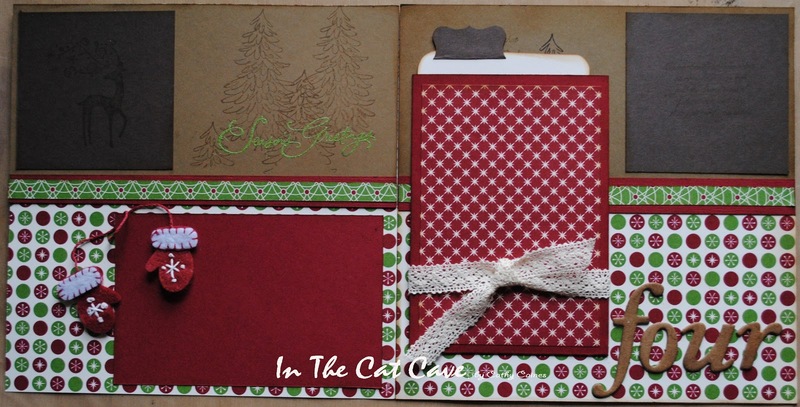 You can see that there is an envelope with a journalling tag to be used for journalling or more pictures! 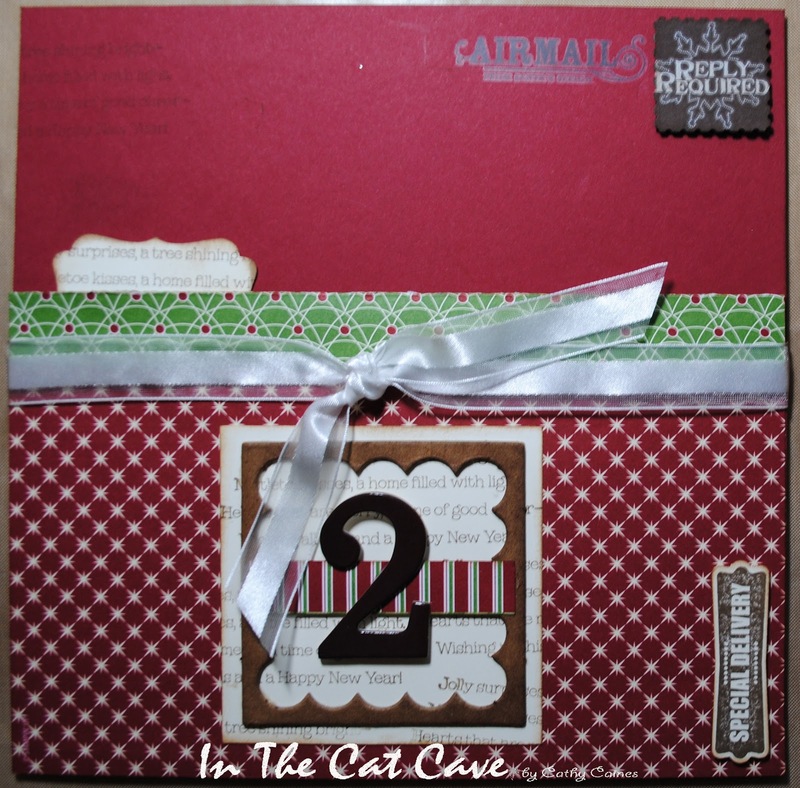 Materials Used: soft suede, cherry cobbler, early espresso & very vanilla cardstock; On Board letters, Be of Good Cheer paper, Victoria ribbon, Dasher stamp set, Evergreen stamp set, soft suede ink, curly label pnuch, corner punch, gumball green embossing powder, Christmas felties (2011 holiday catalogue), and sticky strip. This one is a simple layout without a particular theme in mind. I love this Snow Festival paper - did I mention that already?